Poor Stefan. It will be a month before he finds out he was thrown under the bus. Please, can we wait until the topic is really answered before the Deputies say it is, and then lock the thread???? As of this writing date there's still a problem with the A320-321 family in the v1.2.1.0 release. I believe that's the latest official release, not experimental. Thanks for looking into this. Same thing with the A320 IAE stock United livery using the experimental v1.2.1.3.. Rolled back to v1.2.1.0 and the problem goes away. V1.2.1.3 lets you choose KG or LBS. I switched to LBS and can't help but wonder if the non-Boeing FMS is seeing the weights as KG, not LBS. ?? Knob, using the mouse wheel to rotate it. Just happened to me in the A321 IAE, version 1.2.1.0. Was just coming out of 4X time acceleration before the TOD into KJAC. Worked in previous versions without shutting everything off so I don't know why this new version wants to complain. Did not realize the systems might come back on after a few minutes as I closed P3Dv4.3 after confirming all the electronics were indeed not working. ?? All the views are zoomable in the A319 but not in the A321 so I don't understand your answer. I haven't looked at the A318 or the A320 yet so cannot comment on those. I guess this is an "odd" day, pun intended. A321 v 1.0.0.0 (Installer version), P3Dv4.3, Win10-64 Using the preselected cockpit views I am unable to zoom in or out in the OVERHEAD, LOWER OVERHEAD, ECAM and PEDESTAL views. Other views zoom in and out as you would expect. Anyone else notice this? The real interesting story here is that I don't have a problem with the A319 Pro. Don't think I've ever flown the A318 yet but the A319 ... no problem. Well maybe the checklist occasionally gets hung up during the Start Pushback, but navigation is not an issue. FD and AP are not giving erroneous prompts or readings. It flies from here to there following a flightplan, altitude, speed. So according to your definition of not having issues my computer must be OK. I'll not call it 100% cuz statements like that have a tendency to come back and bite you. CRJ is a different story. Just because you're "unable to understand" my issue does not mean the onus for support is on me. If I was having problems with other aircraft, scenery, or P3D itself I'd be the first to consider a reinstall. But I'm not. If I stay away from the CRJ I don't give myself headaches and actually enjoy flight simming. Yikes! It's the Aerosoft 319, part of the Professional series. I bought all four of the planes but only the 318 and 319 have been released. Sorry about the confusion. As far as the FPS goes I use P3D to limit the FPS to 30. When I do fly with any Shift-Z info showing I'm pretty consistent in the 27.x - 30 range. Sim is smooth with only an occasional pause as I approach some 3rd party airport scenery (Flightbeam KMSP). And when I fly/test the CRJ I keep things to a minimum. P3D, TrackIR5 and CH yoke. Fair weather during the day. Vanilla. Thought I was onto something yesterday when I realized I was completely overlooking FSUIPC. I have a registered version 5.1.3.2 but only use it to calibrate the CH yoke axes and nothing else. Any fsuipc.ini file created has default values except for the yoke calibration section. Let FSUIPC make a new .ini file and compared to the old one. New .ini file had two things not listed in the old one, both in the [General] section. RestoreSimcWindows=No Console=No Makes no sense to me but maybe to someone else. CRJ v1.2.2.0. Flew the KCHA HCH VXV KTRI flightplan including the ILS05 approach perfectly. Turn from HCH to VXV was still uncoordinated and awkward but the AP got the job done. LOC and GS worked but I've never had a problem with them. Before I got excited I tried another flightplan: KORF Rwy23 - KCLT Rwy18C. Fair weather, daytime, no ATIS, FL260. No waypoints, leave KORF and immediately get on STAR CHSLY3.COUPN to ILS18C via JEDKO. Lots and lots of waypoints. I ignored the altitude and speed restrictions and did a constant descent from TOD to JEDKO @ 8000ft. CRJ flew things correctly until KRISS became active leg and it continued to fly straight ahead. I disconnected the AP and turned to intercept the flightplan but the flight path on the PFD kept turning ahead of me. It was like the PFD turned into an automatic direction finder that kept pointing to the KRISS waypoint location. I was not able to intercept and did a Dir To JEDKO. Intercepted the LOC and landed. 18C doesn't have a GS. Flew that same flightplan today under the same conditions with the same result. As soon as KRISS becomes active the AP goes spastic. Going to try this with the v1.2.2.1 ascrj.dll but I am not confident that will matter. I have seen this happen a couple of times on the CRJ. Toggling the Appr button off/on brings the LOC and GS back green. But even without doing that the CRJ followed the ILS. GEK_the_Reaper, I'm not about to reinstall Win10 and P3Dv4 in the hope that will fix the issues I'm having with the CRJs. If I was having issues with other aircraft and/or scenery it would be a no-brainer, but I'm not. If it wasn't for the fact they're regional jets I'd have written them off earlier and never looked back. Not everyone wants to travel halfway 'round the world with a city's worth of people. I've tried no default scenarios, default scenarios from FSX and P3Dv2, stock scenery and all scenery. Stock shaders and modified shaders. I have tried every conceivable way of loading P3D and the CRJs ... all to no avail. If "Ready for Taxi" isn't a recommended loading state it should be taken off as an option. Idea here is to fix things, not find work arounds. I don't do C&D because of the time it takes. If I'm going to be disappointed in a flight why spend more time than is absolutely necessary? 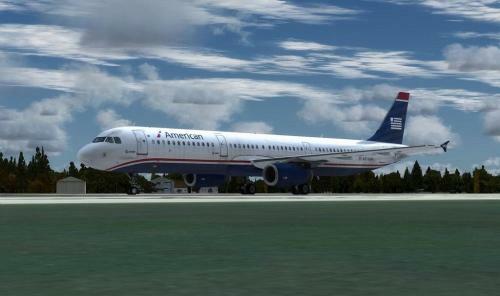 I spent Monday flying the Airbus 319 and aside from a few long landings did not have problems. Which would you choose? Against my better judgment I updated (again) to v1.2.2.1 and navigation problems increased a lot over v1.2.2.0. Catching the LOC and GS are the only things that work consistently in v1.2.2.1. Flightplan I use is KCHA (Rwy20) HCH VXV HOSEM KTRI (ILS05) @ FL230. Passing a waypoint guarantees the CRJ will either continue straight or bank into a shallow right turn, ignoring any FD commands. Also, when passing a waypoint I can watch the AP break. ie: Passing HCH requires a 70-80 degree turn to the right and I can see the FD pivot over correctly. The CRJ goes into a spasm, rolling left and right rapidly for 1-2 seconds before settling into its lazy right bank. And then another flightplan KORF - KCHA (can't remember the waypoints) @ FL360. Just before TOD I got my first ever pressurization failure, the only thing that was supposedly fixed in v1.2.2.1. I remember back a few years when the Airbus 318-321 bundle was going thru its growing pains. About the only major problem I ever had was the 319IAE losing power on takeoff and crashing. Only a handful of users were having this problem. Other users were experiencing a multitude of problems which I could never duplicate. Took a while but most were eventually fixed before the product was abandoned. I've gone back to v1.2.2.0 of the CRJs and its 50% navigation success. But they're parked at Davis-Monthan Air Force Base and don't for a minute think I "seem happy." I understand that first sentence and with all due respect, it's BS. I'd like to see TurboTax or Quicken use that to explain why 1+1 is not equaling 2. No matter how simple or complicated you make the data, all you're doing is adding it or subtracting it or multiplying it or dividing it. Math doesn't lie. If 1+1 does not equal 2 then you did something wrong. If you get to a waypoint and the FD commands a left bank and the AP initiates a lazy bank to the right something is wrong in the flow of the program. It's been that way since I bought the plane back at v1.03 over a year ago. I've setup DAVE to load the CRJ as "Ready for Taxi." Simple enough to do as it's one of the default choices. So why when I load P3Dv4.3 does the CRJ initialize 4 different ways: DAVE on, parking brake off. DAVE off, parking brake on. Both off. Both on. I must be doing something wrong so I try loading the CRJ in every conceivable way. Switching to the CRJ after loading the default Baron58, the AS Airbus 319, Carenado Phenom300, etc. Loading the CRJ directly from scenario startup screen. Switching aircraft states after the CRJ is loaded. Doesn't matter as to which of these 4 ways the CRJ initializes, or at least I'm not seeing a pattern. I didn't program the CRJ so I'm not at fault here. I've tried P3D naked with default scenery and keyboard controls (which isn't fun.) And more realistically with TrackIR5, Eclipse yoke, UTLive traffic, Active Sky weather, Aivlasoft EFBv2 and various scenery by FSDT, Flightbeam, Orbx and others. I've used SIMstarter NG to load various combinations of sceneries, landclasses, airports. I've not used SIMstarter NG. Only conclusion I've come to is the CRJ works half the time in v1.2.2.0. Sometimes the flightplan works, sometimes same plan doesn't. I do not knowingly block Win10 Home from updating itself whenever it feels the need and I keep other FS-related programs up-to-date as well. I monitor manufacturer websites and emails for any potential problems with their hardware or software. I have a GTX1070 using the 398.82 drivers. MSI Tools are telling me all motherboard drivers are current. A locked i7-6700 so no overclocking. If my computer was ice cream it would be vanilla. You can put me down as a user who seems happy ... but I'm really not . And I'm trying to take the high road, but like the OP I'm getting discouraged. I'd suggest that a lot of users are disinterested and/or have cut their loses and moved on. I bought the CRJ on 12August, 2017, and I'm surprised I'm still here. I'm on the latest released version 1.2.2.0 and it's 50/50 whether the plane will fly the flightplan. Which is a whole lot better than previous versions, but still a dismal failing grade. Experimental version 1.2.2.1 is a disaster. It's like reinstalling v1.0.5 and the hotfix 1.0.6.